The Mistress of the Dark lands the leading role in a touching art film about human/gill monster romance, but there’s something decidedly fishy about her costar. Is there an Oscar(tm) in her future, or is director Billy Bullworth interesting in spawning something more than an Academy Award-winning movie? Dive into the first issue of this special four-part miniseries, by David Avallone (ELVIRA, BETTIE PAGE). From the writer of the Dynamite’s Bettie Page comics, David Avallone and Dynamite comics brings us the newest comic starring The Mistress of the Dark herself, in The Shape of Elvira. This time Elvira has gotten a movie deal for an upcoming romantic monster movie. She has been longing to star in her own feature film for years, but had not been offered the role. Her agent called her in for an unusual meeting and she found out that she would be up for the role in a feature film with a famous director, but she finds out that her costar may be a bit too into the role. With art from Fran Strunkan, the amazing writing of David Avallone and others, this was destined to be a success! The character of Elvira first emerged around the 1980s and has been a pop culture phenomenon since. Her character is nostalgic for those who grew up during her initial popularity, but now that Dynamite is releasing new comics her popularity can create a new generation of fans. A lot of teens today are drawn to things that are nostalgic and retro because it gives them a sense of making something old, new again. Teens are also interested in mysteries, leaving the latest comic with a new generation that will be intrigued with the concept. The art style is different than a lot of comics that have come out lately. Typically, the artist tries to draw the reader in with an extreme about of graphics and action happening all on one page, to make up for minimal dialogue. However, in The Shape of Elvira, in this case, Fran did not. The art style is simplistic, yet detailed enough to allow the storyline to flow and develop. A lot of comic book artists feel that loading every page of a comic with nonstop action will entice the reader, but they often do the opposite and overwhelm them. The storyline can get lost in all of the illustrations and make for a confusing experience. Sometimes letting the dialogue speak for itself is a better approach. Dynamite did a fantastic job of having detailed and understandable illustrations that pull the story forward, without creating a sensory overload distracting from the story. As in many of Elvira’s adventures, there are many pop culture references sprinkled throughout the story. From the beginning there were references to other classic cinematic/comic references to bring a bit of humor to the plot. The inside jokes help create a comforting environment for returning readers because not all young readers will get them. Even though everyone may not get the joke, it still makes sense, while making it feel more exclusive for those who do follow. For example towards the beginning of the first chapter, Elvira says, “Wow…This place is amazing! When did the Adams Family move out?” Although not all teenage readers may understand, the comic offers something for every generation. 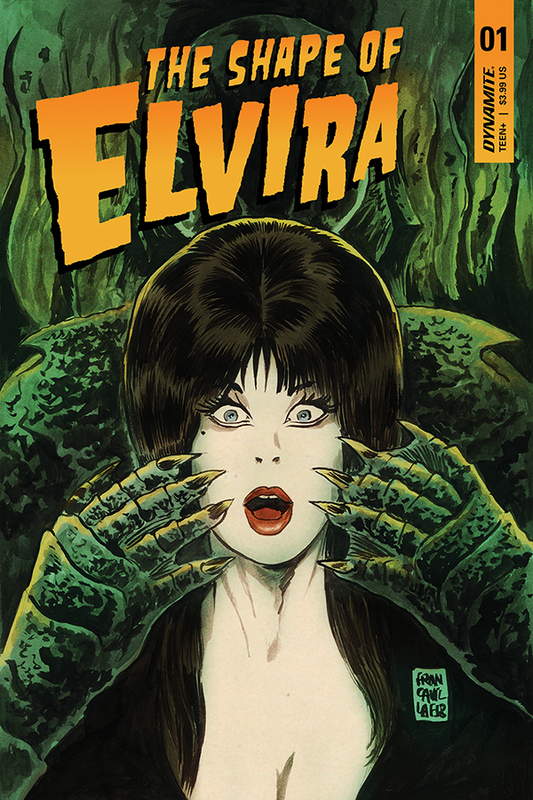 The Shape of Elvira offers a new mysterious, fun, and humorous new adventures for many generations. As someone who has not read all of the comics, but knows her legacy, this was a great addition to the Mistress of Dark’s trilogy. This comic captures the authentic feel and style that anything elvira needs to to capture. I look forward to the next comic!